State spaces represent the way a system evolves through its different possible executions. Automatic verification techniques are used to check whether the system satisfies certain properties, expressed using automata or logic-based formalisms. This provides a Boolean indication of the system’s fitness. It is sometimes desirable to obtain other indications, measuring e.g., duration, energy or probability. Certain measurements are inherently harder than others. This can be explained by appealing to the difference in complexity of checking CTL and LTL properties. While the former can be done in time linear in the size of the property, the latter is PSPACE in the size of the property; hence practical algorithms take exponential time. While the CTL-type of properties measure specifications that are based on adjacency of states (up to a fixpoint calculation), LTL properties have the flavor of expecting some multiple complicated requirements from each execution sequence. In order to quickly measure LTL-style properties from a structure, we use a form of statistical model checking; we exploit the fact that LTL-style properties on a path behave like CTL-style properties on a structure. We then use CTL-based measuring on paths, and generalize the measurement results to the full structure using optimal Monte Carlo estimation techniques. To experimentally validate our framework, we present measurements for a flocking model of bird-like agents. 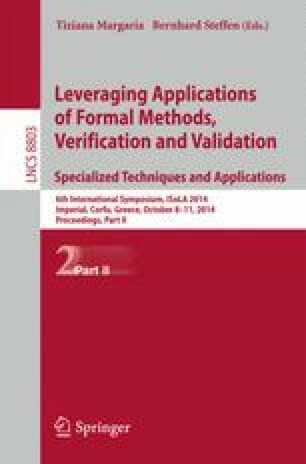 The 2nd author is supported by ISF grant “Efficient Synthesis Method of Control for Concurrent Systems”, award 126/12.